This summary of the Bible is designed for evangelism. Beginning in Genesis and going through Revelation it includes excerpts from the Scriptures with 205 headings and 204 explanatory footnotes to enable the reader to see the unfolding story of the Bible and to understand the Gospel of Jesus Christ. The footnotes contain explanations of Bible words and events. 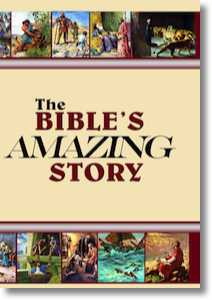 The Bible’s Amazing Story is designed to assist those who are searching for the truth and who want to know what the Bible is all about. It is also an excellent study book for new converts.